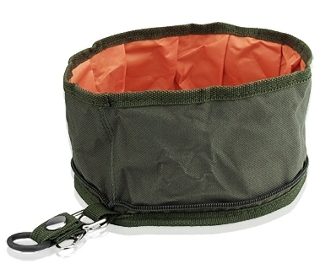 Spotted this cute collapsible travel bowl while browsing Amazon the other day. At first glance I thought it was maybe a catch-all bowl meant to be set up on the counter of a hotel room or something as a way for people to keep keys, wallets, and other travel miscellany in one place. But when I clicked through it turns out that it’s a travel food and water bowl for dogs on the go lol. It’s made of waterproof fabric and makes for a good sized dog bowl but also zips up pretty compactly. Judging by the reviews people seem to like it a lot, with one person even saying that they like to use it to water their horse during outings. The main downside according to the reviews seems to be that when it comes to water it’s only good for temporary use, since if the water sits in the bowl for an extended period of time it will start to leak through. So much for being ‘waterproof’ like it says in the description. Maybe ‘water resistant’ would be more accurate? Or maybe those people’s bowls sustained some kind of damage to break the waterproof seal. Either way if I had this bowl I’d keep that in mind and wouldn’t expect to leave water in it. 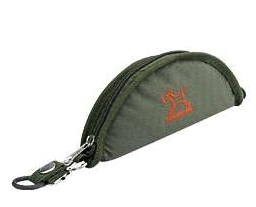 It’s still pretty cool though since it folds down so small and since it can be clipped right to a backpack it would stay out of the way until you needed it. Plus… it could theoretically still double as a catch-all :D.